Voltage-gated ion channels play fundamental roles in neuronal signals, muscle contraction, and hormone secretion. These channels consist of four homologous repeats (within a single subunit of voltage-gated Na+ channel and Ca2+ channel) or subunits (voltage-gated K+ channel and hyperpolarization-activated cyclic nucleotide-gated channel). Each repeat or subunit consists of two major domains: a voltage sensor domain, which senses transmembrane potential, and a pore-gated domain, which regulates ion permeation by forming a pore by tetrameric assembly. The motion of the voltage sensor domain triggers the motion of the pore-gate domain through structural changes between helices or mechanical motion of a linker to regulate ion conductance. The voltage sensor domain has long been believed to be a structure unique to voltage-gated ion channels. 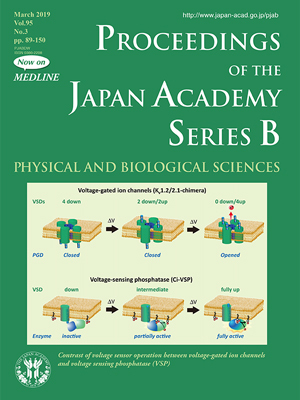 In 2005, Okamura and colleagues serendipitously found a unique protein that has a voltage sensor domain but lacks a pore-gated domain. In this protein, which they called voltage sensing phosphatase (VSP), a cytoplasmic enzyme with activity of phosphoinositide phosphatase, similar to PTEN, is linked to the C-terminus of the voltage sensor domain. Upon membrane depolarization, the upward motion of the voltage sensor domain induces structural changes in the enzyme region, resulting in dephosphorylation of PtdIns(4,5)P2 into PtdIns(4)P. In contrast to voltage-gated ion channels that have four voltage sensor domains, where pore opening usually requires full activation of all four voltage sensor domains (except in some rare cases, dependent on the species of voltage-gated ion channels), graded enzyme activity of VSP is induced dependent on the extent of the motion of the voltage sensor domain. The unique nature of VSP is favorable for slow, voltage-dependent regulation of turnover of phosphoinositides in cells that do show little or no change in membrane potentials such as action potentials in neurons. In fact, VSP is expressed in nonexcitable cells such as testis cells or epithelial cells.